Fit 1 dough round into a 9-inch deep-dish pie dish and gently press into the dish. Trim the edges flush with the rim. Reroll the dough scraps and cut out shapes using decorative pie cutters. Refrigerate the pie shell, cutouts and remaining dough round for 30 minutes. To make the salted caramel, in a heavy 4-quart (4-l) saucepan over medium heat, combine the sugar, water and lemon juice. Cook until the mixture bubbles vigorously and turns a golden amber color, about 9 minutes. Stir the sugar with a wooden spoon during the first 2 to 3 minutes of cooking; do not stir after this point, instead swirling the pan to ensure even cooking. Watch the caramel very carefully, and as it will go from amber colored to burned in a few seconds. Remove the pan from the heat and immediately add the cream very carefully; the mixture will bubble and splatter, so protect your hands and arms with heavy oven mitts and use a long-handled wooden spoon. Stir until the sauce is smooth and blended. Stir in the salt and let cool until just warm. To prepare the apples, in a large Dutch oven over medium heat, stir together the apples, brown sugar, cinnamon, nutmeg and lemon juice. Cover and cook, stirring occasionally, until the apples are just tender, about 20 minutes. Uncover and let cool to room temperature. Stir in the cornstarch and salt. Let the pie shell, cutouts and dough round stand at room temperature for 5 minutes. In a large bowl, combine the apple mixture and 3/4 cup (6 fl. oz./180 ml) of the caramel; reserve the remaining caramel for serving. Pour the apple filling into the pie shell and place the top crust over the pie. Trim the edges flush with the rim and press the top and bottom crusts together. Brush the underside of the cutouts with egg wash and gently arrange them on the pie. Brush the entire top crust with egg wash and sprinkle with the granulated sugar. 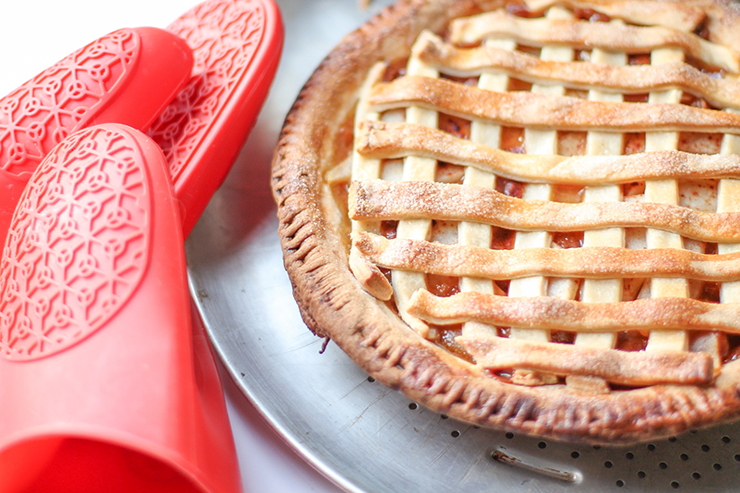 Place the pie dish on a baking sheet. Bake until the crust is golden brown and the apples are very tender, about 1 hour; check the pie after 30 minutes and cover the top and edges with foil if they become too dark. Let the pie cool on a wire rack at least 2 hours before serving. In a small saucepan, reheat the reserved caramel sauce over low heat just until warm. 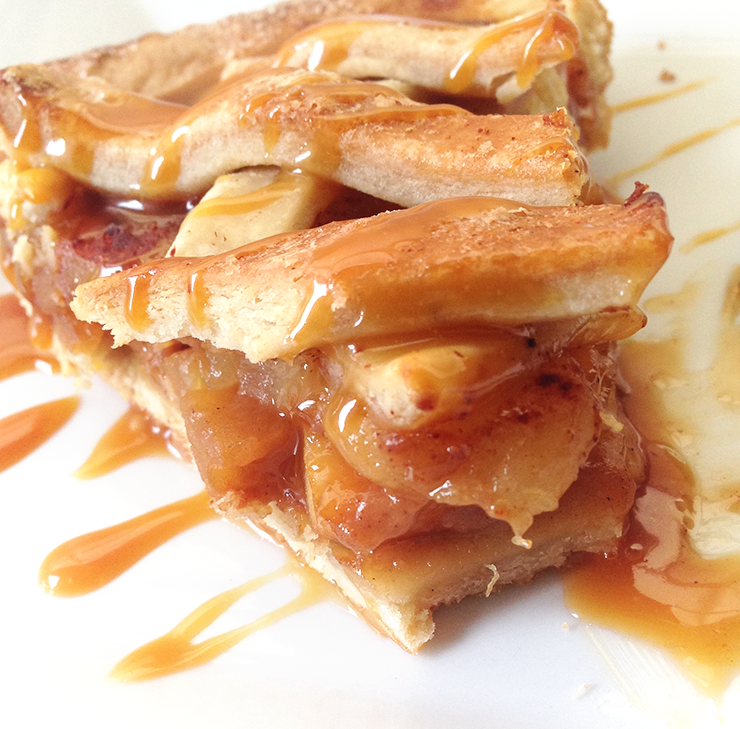 Cut the pie into slices, sprinkle with flaked salt to taste, and serve with the caramel sauce.